PHer 'Lifted' - an appropriate name, we'd say - has taken it upon himself to build "something a bit different, to make sure everyone knew I was taking the piss." Different is certainly right! What was once a top of the range NB 1.8 Phoenix special edition is now something rather more silly, having been treated - amongst other things - to a lift kit, flared arches, off-road tyres with new steel wheels, nudge bars, spot lamps and new spoilers. And it looks, well, incredible to be frank, the OP stating that it drew "the biggest crowd, the biggest laughs, and the most questions" at a recent car meet. It's not stopping here, either. 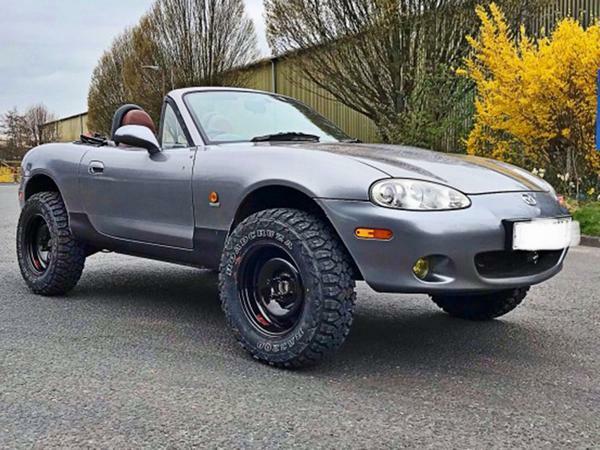 Lifted - also known as Tim - has ordered more parts for the MX-5. Which all sound jolly exciting. Unsurprisingly praise has been coming from all quarters of PH, the dedication to a daft project finding plenty of fans. That so much has been completed so quickly is some achievement, too. So well done, Lifted, for conjuring up something so brilliant and seeing the project through. We're loving your work! Despite being a relatively young thread, there's plenty to catch up on with this amazing MX-5 - read it here.